If you’ve paid any attention to pop culture in the past few months, you may know about The Avengers, which grossed roughly all of the money. It had a lovable cast of superhero misfits all fighting against the evil overlord trying to take over the planet. That evil overlord was Loki, Norse god of mischief and lies—also known as an alien and Thor’s adoptive brother from the imaginatively named Thor. Yeah, yeah, that’s all well and good, but we know all that. Why is he interesting enough to feature here? Well, because sometimes Loki is a woman. I am not speaking metaphorically here, either. (Though, we will get to that in a moment.) 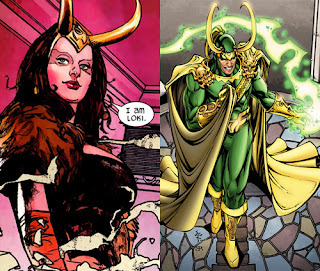 Loki in the Avengers comics is actually sometimes portrayed as a particularly voluptuous lady. And she’s pretty freaking cool. She’s also super accurate as far as representations of Norse mythology go. 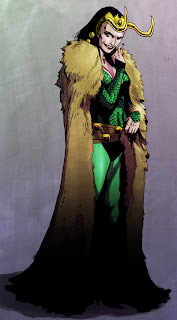 The traditional Loki is not only a god of lies, but also a shapeshifter, and prone to appearing as a beautiful maiden in order to tempt the other gods, or giants, or whatever. He comes to them, does…business with them, and then leaves, having achieved some sort of victory. He also sometimes gets pregnant, because I guess gods aren’t that smart about birth control. Traditional Loki has three main children, but other ones are mentioned as scattered throughout the realms because Loki is kind of a ho. He has Sleipnir, an eight-legged horse that he had when he, um, lay with Odin’s stallion (no idea what the plan was there). He has Hel, the goddess-ish of death, who appears as a little girl rotting from the inside out. And he has Jormungandr, the world serpent, who was so hungry and terrifying, that Odin cast him out, and he landed in Midgard (Earth). He is so large that he can circle the world and bite his own tail. When Ragnarok comes, Jormungandr will rise and his motion will churn the ocean into milk and he will devour the worlds. And Loki is his mommy. I’m not trying to make a huge point about Norse mythology here, I just think it’s all really interesting. I think it’s even more interesting that Marvel didn’t just cover this over and go with a standard “history, what history?” answer. 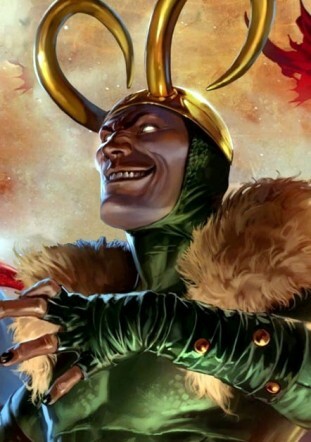 That they took Traditional Loki’s weird and ran with it. Loki’s a dude who’s sometimes a chick and has a ton of kids, some of whom he gave birth too. In addition to all this, he’s also a Frost Giant, and they may or may not have gender, so it’s a little confusing to know exactly what’s going on, but either way, he’s an interesting dude. Metaphorically, though, Loki’s actually basically a woman. Hear me out here. In the Avengers movies, we see Loki grow up. Constantly in Thor’s shadow, practicing magic instead of learning to fight, always skulking around the edges of the battle, going for stealth instead of brute strength—these are traits that are more traditionally associated as feminine. Loki’s a flirt, a prima donna, a diva, and they say as much. His daddy issues are pretty much off the chart. There’s also the small matter of the fact that he plays the evil sorcerer coming to destroy the world, a role more commonly found occupied by women. See also Morgana, Maleficent, Ursula, and countless Doctor Who villains. Loki is the sorceress who wants everyone to look at her while she completes her brilliant master plan and has the world begging at her feet. I’m just saying, it’s usually a chick who does that. 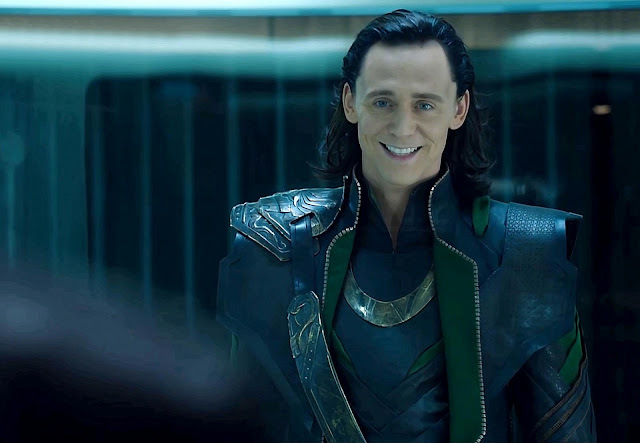 So, Loki is kind of a man, kind of a woman, and whole buckets of crazy. Why should we care? Bra-freaking-vo, Marvel. That’s how you tell a good story. You keep the interesting stuff, and you let it work for you. Maybe that means that you’ve got a character that puts on genders like jackets, but that’s okay. It’ll make you about twenty times cooler than those stuffy one gender people.